The Division of General Pediatrics specializes in teaching the fundamentals of pediatric care to all pediatric residents and medical students. Both students and residents spend time working in our various clinics, hospitals and community sites. We provide a broad clinical education that prepares our graduates for careers in primary care, child advocacy or fields of further specialization. In addition, our division faculty coordinate a number of special programs that provide opportunities for more in-depth exposure to areas of interest within general pediatrics. 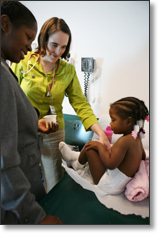 Vist the UCSF Pediatric Residency Program for more information. The Division faculty play a key role in the core UCSF clinical rotations, as third year students spend six weeks in a core pediatrics rotation. This clerkship is under the direction of Carrie Chen, MD. Students rotate in the primary care clinics, nursery, urgent care clinics and pediatrics ward. The Primary Care Pathway is available to five residents in the Pediatric Residency Training Program per year. Primary Care Residents learn how to provide superb clinical care to the children of the community through enhanced practice-based training and to collaborate with community organizations to address local child health problems. Residents have extra clinic time devoted to primary care and development of longitudinal community projects. The Primary Care Pathway is under the direction of Emily Roth, MD. Residents are mentored by Primary Care Faculty at the Mt. Zion Practice and by community pediatricians. They graduate with a keen understanding of how pediatricians can contribute to children's health on the individual and community level. All of our pediatric residents spend a month learning more about the broader community that influences children's health. The PIS Program is under the direction of Anda Kuo, MD. This rotation utilizes resources in the community and within UCSF to provide residents with a structured learning experience which addresses issues of domestic violence, political advocacy, health policy, and cultural competence. Residents work with leaders from local advocacy organizations and faculty from UCSF's Institute for Health Policy Studies. The vision of the PLUS program is to train and inspire future leaders in pediatrics to identify and address the varied issues that affect the health of underserved children. The PLUS Program is under the direction of Anda Kuo, MD. The PLUS program provides a foundation of skills, knowledge and mentorship from which its graduates will build careers in research, policy and community engagement for underserved children. To create a network of support, the PLUS residents all have continuity clinic based at San Francisco General Hospital and are clustered into advising groups along with senior residents and a faculty member. The training for PLUS is fully integrated with the General Pediatric Residency Program at UCSF to include all components of clinical training to achieve the high standard of clinical care required to practice General Pediatrics. For more information, please visit the PLUS website. The General Pediatrics Fellowship Program has been training academic general pediatricians for the last two decades. The fellowship is a two-year training program designed to provide General Pediatrics Fellows with health services, clinical and epidemiologic research training, as well as an overview of child health issues. The goal of the General Pediatrics Fellowship Program is to prepare clinician-researchers and clinician educators for a career in academic pediatrics. The program provides opportunities for research collaboration with mentorship from UCSF faculty, opportunities to present research at regular forums, and opportunities for clinical teaching and care. For more information, please visit our Fellows' College website.